David learnt the game as a teenager from his father, Ian, and made his tournament debut in 1987. 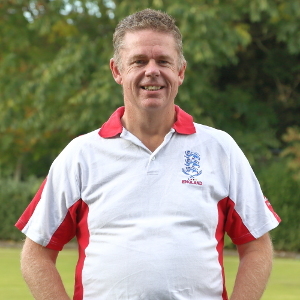 He improved steadily over the next two years and then kickstarted his playing career by winning the 1989 Chairman’s Salver and the 1990 President’s Cup, giving an early indication of his prowess in the double round robin format and gaining a place in the top ranks of English croquet that he has held ever since. David was a founder member of the GB Under-21 squad which also included Robert Fulford and Chris Clarke. These three went on to form the foundation of successful GB MacRobertson Shield teams for over 20 years. A particular highlight of David’s MacRobertson career was his defeat of Toby Garrison in the decisive 21st match in the 11-10 victory over New Zealand in 2000. He has since gone on to win the President’s Cup a further four times, most recently in 2016, the Men’s Championship four times, including three victories from 2015 to 2017, and the Open Championship in 2005 and 2018. Internationally, he achieved three victories in the Sonoma-Cutrer World Championship. However, his most impressive individual tally is in the four English Regional Championships. His record of twelve Eastern, ten Northern, six Western and four Southern Championships since 1992 seems unlikely to be rivalled. Administratively David is perhaps most visible as a regular manager of the Open Championship but also served for many years as the Chairman of the CA Association Croquet Selection Committee and more recently the on the CA Tournament Committee. However, it is as a national team representative that David is peerless. With 23 appearances, many as captain, he has played in more than twice as many Home Internationals matches for England than anyone else. David also has nine Solomon Trophy appearances for GB to add to his record twelve appearances in the Maugham Salver. In 2014, he made his seventh appearance in the MacRobertson Shield in which he played his 100th match, 71 of them victorious. He made his eighth appearance in 2017 which is the second-highest ever achieved (shared with Robert Fulford and Stephen Mulliner and only behind John Prince with nine). He is second on the all-time victory list only to Robert Fulford. It is this dedication to team events which has underpinned British and English success for more than twenty years that deserves particular recognition.